As I gazed across the little creek that I was following, I spotted a spider hanging in midair. The spider scrambled up one of its silken threads as I approached and stopped just short of the branch from which it had been hanging. It was pretty dark in the shade, so I cranked up the ISO to 1250, popped up the built-in flash, and propped the camera against another tree for stability. 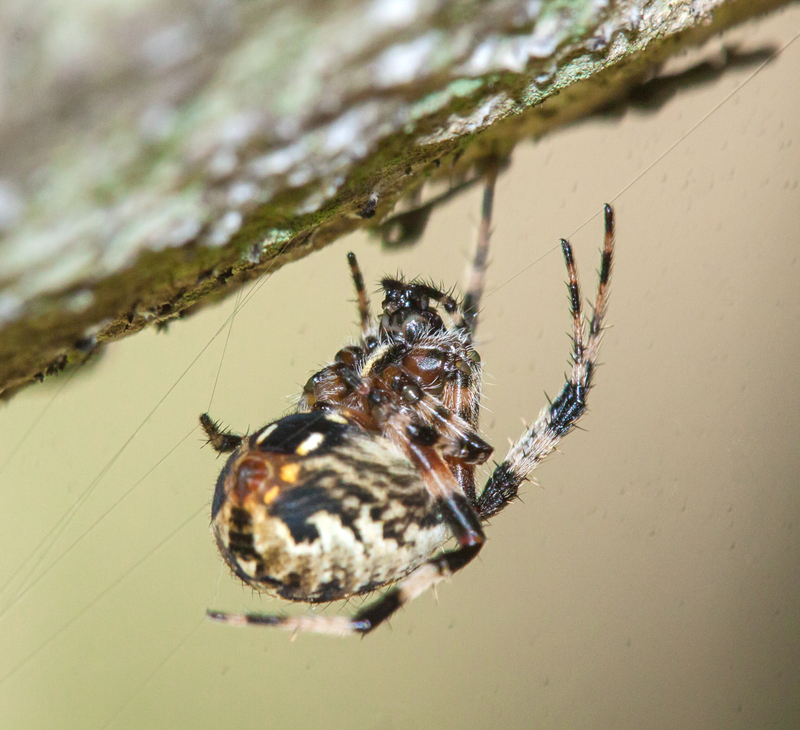 Of the images that I attempted, this is the best one I managed of what I believe is a Spotted Orbweaver spider (Neoscona crucifera). Great head detail in the face of a difficult angle, Mike. I’ve had the on-camera flash come to my rescue a number of times, too. Sure is nice to have it! Thanks, Gary. I’m a little surprised that Canon figures that pros don’t need the pop-up flash. The joys of taking photos in a dark forest. It’s something I run into all the time. This one came out quite good, all things considered. I was fortunate that there was some light in the background, which the flash did not overpower, so it looks a bit more natural than if the background were all black. Amazing photo, I am amazed you where able to also capture the strands of the web as well as the spider. Thanks, Charlie. One of the joys of a macro lens is being able to capture details like that (though I must say that I too was a bit surprised at being able to see some of the strands of the web from which the spider was hanging.